A 100% Purebred (16/16) White born Few Spot (Ee aa LPLP) Knabstrupper, Thore vom Pferdehof is also KNN and ZFdP Premium Graded and 30 day performance tested in Germany. 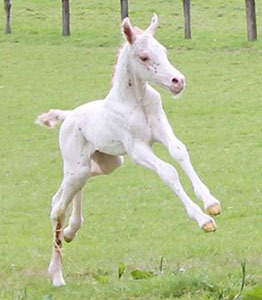 Thore's progeny will always have spots. Thore's latest news can also be found on his Facebook page. 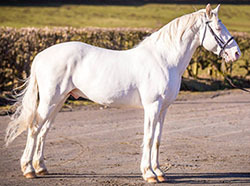 Thore's sire, Talisman aus der Schuetzenden Hand was bred by and stands at the largest Knabstrupper stud in the world, famous for breeding classic foundation Knabstruppers. Thore's dam, Salome af Hestedale, was also bred and retained by another stud famous for it's classic foundation breeding. 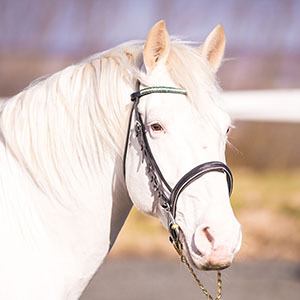 Salome's sire, Stjerneprinsen Af Vejrup is a famous Knabstrupper Stallion bringing exciting history to Thore's pedigree. 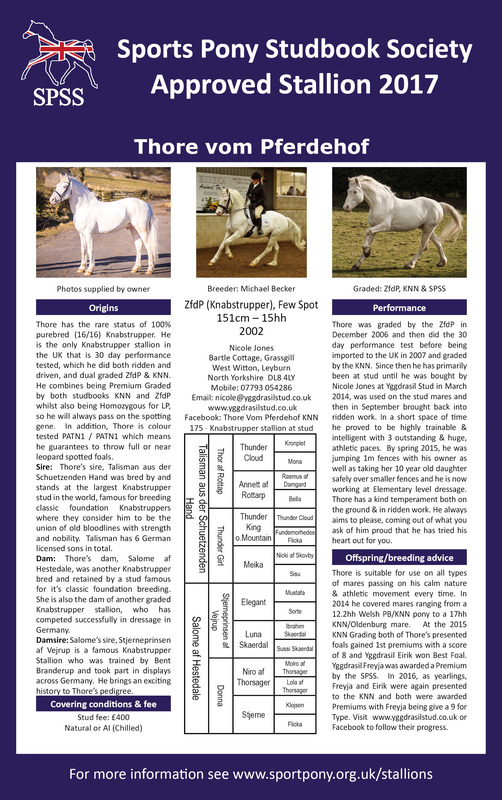 Thore was graded by the ZFdP in December 2006 and then did the 30 day performance test (which included being driven as well as ridden) in May/June 2007. He was then imported to the UK in 2007 and graded by the KNN. Since then he has primarily been at stud. He was bought by Nicole Jones at Yggdrasil Stud in March 2014, was used on the stud mares and then in September brought back into ridden work. In this short space of time he has proven to be highly trainable and intelligent. He has 3 outstanding and huge athletic paces. By spring 2015, he was jumping 1m fences with his owner as well as taking her 10 year old daughter safely over smaller fences (see video below). 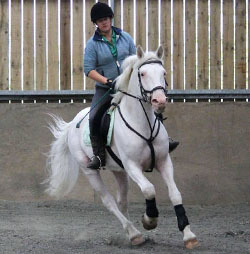 Thore has a kind temperament both on the ground and in ridden work. He always aims to please, coming out of what you ask of him proud that he has tried his heart out for you. Thore has the rare status of 100% purebred (16/16) Knabstrupper. 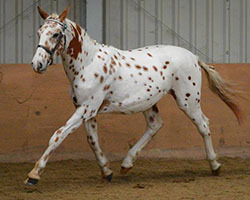 He is the only Knabstrupper stallion in the country that is 30 day performance tested which he did both ridden and driven. He combines being Premium Graded by both studbooks KNN and ZfdP whilst also being Homozygous for LP, so he will always pass on the spotting gene. In addition, Thore is colour tested PATN1 / PATN1 which means he guarantees to throw full or near leopard spotted foals. 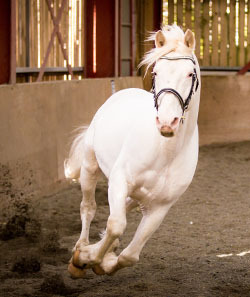 Thore is suitable for use on all types of mares bringing his calm nature and athletic movement every time. In 2014 and 2015 he covered mares ranging from a 12.2hh Welsh PB/KNN pony to a 17hh KNN/Oldenburg mare. Visit the www.yggdrasilstud.co.uk or Facebook to follow their progress. One of his oldest UK born progeny is Top Dottie, who is out of a TB mare, and is owned and bred by Victoria Humphreys. Top Dottie is now competing in British Dressage (BD) competitions at Medium level after making her BD debut at Elementary in August 2015. 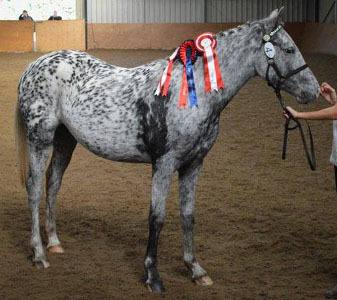 Top Dottie has won 60 pts so far at the 2 levels, competed at Elementary Restricted in 2015 Area Festivals and the 2016 Winter Regional Championships then at Medium Bronze Area Festivals in 2016. Top Dottie is also showing great ability jumping. 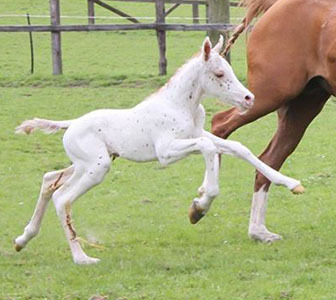 At the 2015 UK KNN Grading both of Thore's presented foals gained 1st premiums with a score of 8 and Yggdrasil Eirik won Best Foal. Then Yggdrasil Freyja received a SPSS Premium at her youngstock evaluation in September. In 2016, as yearlings, Freyja and Eirik were again presented to the KNN and both were awarded Premiums with Freyja being give a 9 for Type. 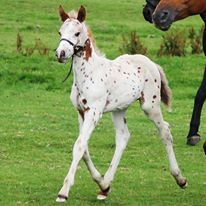 Chestnut leopard colt. 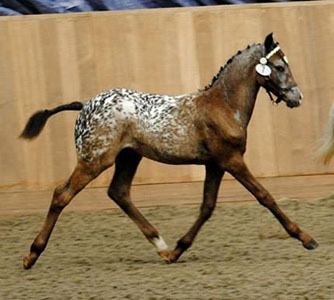 Dam: Kadan Blue Darade (Dara), a Caspian Arab mare by Darkhorse Darius. Born 14 May 2016. Breeder: Katy Smith; owner Cherylynne Weston. Won his Pony Breeding 'foal' class at the 2016 Stokesly Show.